Just a 3-minute walk from Izmir Exhibition Center,Deka Evleri offers spacious apartments with private kitchens and free Wi-Fi.Basmane Train Station and Basmane Metro Station are 600 meters away. 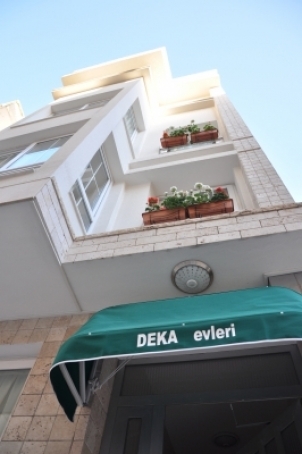 Deka Evleri air-cpnditioned and furnished in a modern style,with 2 bedrooms and a living room with an open-plan kitchen.All apartments have French balconies. The apartments have LED satellite TV.There is also a microwave,stove,electric kettle,free tea and coffe,fridge,kitchen utensils and a dining area.The en-suite bathroom includes a hairdryer and free toiletries. Laundry service is available upon request..
Deka Evleri is a 20 minute walk from the Kordon.Izmir Fair Center can be reached in 3 minutes on foot.This pet friendly service is provided at an additional cost to Izmir Adnan Menderes Airport,15 km away.